Source: "The Pictorial Year-Book and Calendar for 1888," a from the Buffalo Express. Buffalo: Matthews, Northrup, & Co.
Thomas Day owned the land on which Cottage Street was built, from Maryland to Hudson Streets. It was conveyed to him by the State of New York in 1828, and he sold it to Alanson Palmer in 1835. Palmer subdivided it and sold it as lots. Cottage Street once exemplified its name. A sleepy suburban lane at the mouth of Thomas Day's Park, it boasted a dotting of sturdy, bright worker's cottages and austere two-story Italianate houses with spare stoop entrances and well-tended kitchen gardens. Many of the houses have survived. Cottage Street became the street of coal kings. The Great Lakes trade required enormous quantities of fuel and when steamboats converted to coal, and coal itself became available trade commodity for shipment, men who had made money selling fuels saw the potential for vast profit. Thomas Coatsworth's family came to the United States from England via Ottawa, Canada, in the early 1800s, settling on a large farm to the northeast of the city. Young Thomas moved into the city of Buffalo during the first flush of its boom days. He sold wood and later coal to lake shippers, amassing a substantial enough fortune to buy a retreat of several thousand acres on Grand Island, probably from Lewis Allen. 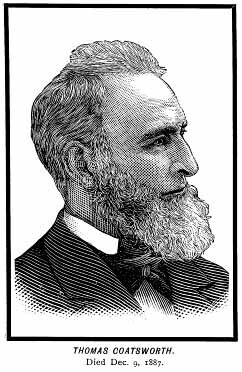 His fortune flourished in the second great boom after the Civil war, when he purchased several lake vessels which plied the Great Lakes from iron Mountain to the St. Lawrence. He became a pioneer in the local grain trade, establishing one of the first waterfront grain elevators in Buffalo [and digging the adjoining Coatsworth Slip]. 49 Cottage is the house that Thomas Coatsworth built for his bride, Electra, in 1869.. An altogether extraordinary structure, the Coatsworth mansion is an example of Second Empire architecture taken to the degree of fantasy. The octagonal tower at the corner of the house rises four stories from the street, crested with decorative cast iron. The stone window caps and their carved Eastlake design detailing are notable, as are the stone quoins which corner the building. The Neville coat of arms, under which banner the Coatsworth family served during the War of the Roses, is carved in stone above the entryway. Twenty years later, in 1899, Thomas Coatsworth built again, this time a house for his daughter, at No. 55 Cottage. - Source: "Buffalo's Brick Italianates: An Allentown Legacy," by Sonia R. Efron. 1994. Photos and their arrangement © 2001 Chuck LaChiusa..